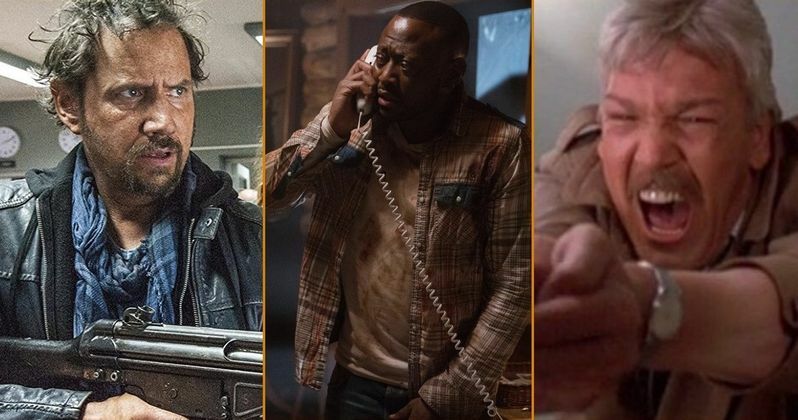 Director Patrick Lussier and screenwriter Todd Farmer's new Halloween-themed horror flick Trick has just added Omar Epps to the cast which already includes the likes of Tom Atkins (My Bloody Valentine 3D, Night of the Creeps), and Jamie Kennedy (Scream, Tremors: A Cold Day in Hell). Ellen Adair and Kristina Reyes also star. The story centers on an elusive serial killer, who descends upon a small town annually. He is responsible for gruesome murders year after year, each seemingly unrelated. No one believes this could be the same killer. Epps will be playing the lead role of Detective Denver who has faced Trick once before, having shot and killed him. Or so everyone keeps telling him. However, Denver knows Trick is still out there, and he's coming back for revenge. Producer Ellen Wander (Dolan's Cadillac, Spinning Man, Misconduct) stated this. Omar Epps is an actor I think we all know as Phil from Wes Craven and Kevin Williamson's Scream 2, but the man has also starred in such late 90's-early 2000's flicks as Against the Ropes, Dracula 2000, Love & Basketball, In Too Deep, The Wood, and The Mod Squad co-starring Claire Danes. Epps kicked off his career alongside Tupac Shakur in Ernest Dickerson's Juice, but mostly nowadays Epps seems to stick to TV with roles such as Dr. Eric Foreman on House and Isaac Johnson on Shooter. The role of Detective Denver in Trick was originally set to be played by Dermot Mulroney (Insidious: Chapter 3, My Best Friend's Wedding) before Epps recently stepped in. As mentioned above, Trick also stars Ellen Adair (Showtime's HomelandBillions, and USA's The Sinner) as Sheriff Lisa Jayne, the sheriff in the small town of Benton who has always considered Detective Denver as her mentor. Cheryl Winston, the only survivor of the latest round of killings in her small town, will be played by Kristina Reyes (Blindspot, Shades of Blue). Tom Atkins plays Talbott, and Jamie Kennedy will play Dr. Steven. Lussier made himself a name as a director on straight-to-video sequels such as The Prophecy 3: The Ascent, Dracula 2000, Dracula II: Ascension, Dracula III: Legacy, and White Noise 2: The Light. But more impressive still is Lussier's work as an editor. The man was Wes Craven's go-to editor for years cutting such Craven classics as Vampire in Brooklyn starring Eddie Murphy, New Nightmare, Scream, Scream 2, Scream 3, Music of the Heart, Cursed, and Red Eye starring Rachel McAdams and Cillian Murphy. On top of those flicks, Lussier also edited Friday the 13th Part 2 and Lake Placid director Steve Miner's Halloween H20: 20 Years Later, Guillermo del Toro's Mimic, and David Moreau and Xavier Palud's remake of The Eye. And let's not forget far and away the best motion picture on Lussier's resume, D3: The Mighty Ducks starring Emilio Estevez and Joshua Jackson. Meanwhile, Todd Farmer has lent his pen to such genre screenplays as James Isaac's tenth entry in the Friday the 13th series Jason X aka Jason Goes to Space, and The Pang Brothers' The Messengers starring Kristen Stewart and Dylan McDermott. But that's not all. Farmer also wrote Martin Barnewitz's Messengers 2: The Scarecrow starring Norman Reedus and Claire Holt. Together Farmer and Lussier have created some neo-classics of our genre such as the 2009 remake of My Bloody Valentine 3D starring Jensen Ackles, Jaime King, and Kerr Smith, and Drive Angry starring Nicolas Cage and Amber Heard. Principal production has begun on the Lussier/Farmer horror thriller Trick in New York with Film Bridge International handling worldwide sales. Also, Film Bridge International has partnered with Chimney's Fredrik Zander to handle post-production. This scoop comes to us via Dread Central.